Features a nonstick coating and patented slope design. A 5-serving grill. Cook for the whole family in less than 20 minutes. Features a nonstick coating and patented slope design. Creates healthy meals. Removable plates are dishwasher safe. 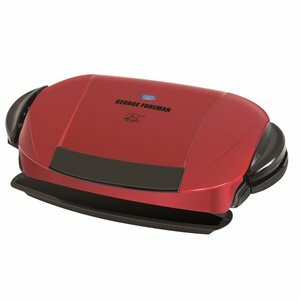 The George Foreman Next Grilleration™ is here. This 5-serving grill allows for easy cooking for the whole family in under 20 minutes. The nonstick coating and patented slope design make every meal a healthy one. And clean up is also worry free thanks to the dishwasher safe removable plates. Cook for the family or friends with a grill surface designed for 5 servings. Or make two complete meals at once - try grilling veggies! Large enough space to grill for five, this is the perfect tool to use when entertaining. Cook five burgers or chicken breasts at once, or sear up some veggies on the side for a complete meal in minutes. Don't worry about the mess. When you're done grilling, toss the two removable grilling plates into the dishwasher. A step up from the Classic Plate Grills, removable plates can be removed from the grill unit to be placed in the dishwasher for easy clean up! When your meal is done cooking your grease will have ended up in the dishwasher safe drip tray. This means meal are less greasy and easier to clean up.